SACRAMENTO REGION, CA (MPG) - In a Carmichael home where a family with three boys under 10 live, super heroes are widely respected, and even part of the décor. Breakfast is served on top of Avenger placemats and Superman and Thor are nearby. Ironically, the kid eating his cereal from a bowl placed on top of Black Panther (his favorite) is a superhero in his own right. 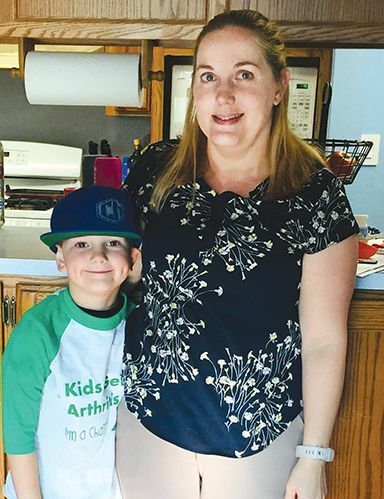 He is sharing his own battle with juvenile arthritis to bring awareness to the disease. Six-year-old Jeremy Kelley will leave Black Panther behind and don a reindeer suit for a day the whole family is celebrating. Jeremy will be leading the Reindeer Games and Kid Run at the Arthritis Foundation’s 2018 Jingle Bell Run for Arthritis, supported by Sutter Health (where Jeremy’s mom works). The race takes place on December 9. Jeremy’s warrior-status journey started right before his third birthday. He was simply doing what kids do when they are three, but had a decidedly different outcome. “Jeremy jumped off the couch in the living room and onto a beanbag chair,” his mother, Jaime Kelley says. In a few days, his leg was swollen to triple its size. X-rays didn’t show any damage, but Jeremy didn’t improve over time. Clearly, jumping off the couch was not the issue. The Kelleys went to their own pediatrician, were referred to Shriners Hospital and got an appointment several months later. By that time both knees and an ankle were severely swollen, and Jeremy was back to crawling. Doctors there did testing, but were also stumped by Jeremy’s severe symptoms. Shriner Hospital suggested taking Jeremy to UC San Francisco, where doctors there gave him aggressive joint injections. They worked. Unfortunately, the “miracle” really wasn’t. Despite Jeremy’s new-found mobility, the disease wasn’t subsiding. More shots followed, and injecting the medicine was up to mom. Jeremy developed a bad case of shot anxiety, turning the household into turmoil when it was time for yet another one. Knowing the injection routine was impacting the family and hoping the disease was in remission, the doctors decided to give Jeremy a break from the rigid shot regime. The symptoms returned. So now the Kelleys are in management mode, continuing with the injections sometimes, seeing a therapist for the shot trauma — and coping. Pain is still prevalent, and doctors say the remedy is harsh: push through it. “It’s something we will just have to deal with,” says Jaime, “Right now we are trying yoga.” Grateful for the help she received from the Foundation, Jaime is now an Arthritis Foundation activist who mentors— and learns from — other parents and the staff and board of the Foundation. Andrew Pete, service line director for Perioperative Services at Sutter Medical Center Sacramento, is the Northern California Arthritis Foundation chair. He is one of many Sutter Health community volunteers who donate expertise and services to nonprofits throughout the region. Juvenile arthritis affects more than 300,000 children in the U.S., a figure experts consider on the low side. Considering the obstacles and determination parents must endure to convince their medical provider that the symptoms are more than just kids being kids, the disease is underreported and appallingly undertreated. The Arthritis Foundation is trying to change the trajectory of misdiagnosis by funding cutting-edge research for new treatments and discovering a cure, advocating for health care access, and offering support to victims of the disease. Meanwhile, Jeremy loves to escape his trials and play Pie Face, a game-in-a-box with rules that dictate that if you are the unlucky opponent, a lever slaps whip cream all over your face. Jeremy thinks it’s hilarious.